I have several Light and Motion headlights and bought this one for winter commutes, which often require a mid-day charge while at work. This model fills up much more quickly than my other ones-approximately 90 minutes vs several hours. The battery seems to conserve its charge in extreme cold better than my other older models. Otherwise, it's the same tried and true, user-friendly, and understated Light and Motion design. The flashing sequence can be seen for a great distance- bought them for all the cyclists in the family. Excellent quality- sturdy too. I deliberated between this light and the Light and Motion 1000. I ended up with this one because (a) I don't think you really need 1000 lumens in a city environment and (b) because it matched my bike better. I've been really happy with it. It comes with a GoPro attachment which I mounted to the bottom of my K-Edge computer mount. This light is very compact...moreso then most other lights I've seen. The brightness is more than you would ever need unless you are biking at 20 mph. The side lights are bright for their small size. The quick charge takes about 45 minutes to recharge. The only thing I don't like is the lights daytime slow pulse mode. A flashing light is much more visible than this one. That is why I gave this light a 4 rating. Very bright. Does not have a strobe option but has pulsating. Not quite the same. Lights up the road really well at night. Attaches to the handlebars with a strong rubber strap. Need to pull with some force to attach securely. I like the light a lot although I prefer the way that my previous cateye light attached to the handlebars. Easier to quickly remove and replace. Charges quickly. Solid, durable, and long-lasting battery life make this a winner! I bought this light as a daily special and I am so thankful I did. I have used it for a couple of months now as my primary light for night dirt roadie and trail group rides. Our rides are two hours long and the battery indicator light is still green at the end of my rides (I run it on low power, which is still more than adequate for a safe illumination level). The light feels solid and durable (no cheap plastic feel) and it fits securely to my handlebars. I would highly recommend this to any of my biking friends! This light is used for all early morning commutes before the sun comes up. It's so bright and the angle of light is so wide, that its like driving a car. An excellent light. Removal for charging and bracket are excellent. All micro USB charging cables are a pain to me. Have to pay too much attention to how I put it in. I am very happy with this light. Seems brighter than 800 lumens and others have commented that as well. I little hard to slip on and off of the receiver but I will probably get better with practice. It was a steal. It does charge quickly, and is as good as they get for 800 lumens. Living in Alaska, I'm one of many bikers who feel I cannot spend a lot of time indoors in winter just because it's dark and I can't see the moose. I enjoyed using a Light And Motion helmet light for my Trans Am ride in 2015. With the knowledge of their quality, I found this small and mighty light source to add to the fat bike. Many of us here use one light on the bike aimed at where the front wheel will track, and another on the helmet that can be guided as needed to see to the side of that cone of brightness. This Urban 800 fills in the wheel track very nicely and I also enjoy the other modes. I do prefer a flash mode to a pulse mode scares off dogs better but I've read that flash is not legal in some countries. Also, I like that I can quickly take this light off the bike when I lock it outside a business and just tuck the light into my pocket. The switch has withstood a variety of elements from cold, to freezing rain, to a hard snow squall and it keeps working fine. The small amber side lights are a good thought, though I don't know that I have needed them so far. I do like them on my helmet light, so it's a natural progression. For the record, the brightness is not enough for fast night time singletrack, but I don't do that so much any more. 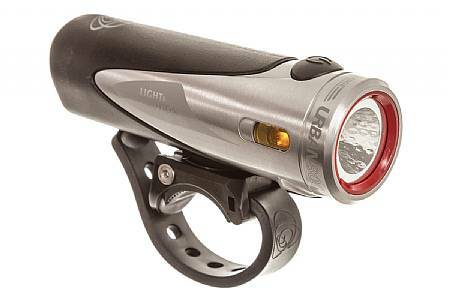 If you're looking to scream through the trees at night, you're going to want adjustable 2000 lumens. Haven't actually used it for mountain bike night riding yet, but am currently using it to run through the city streets at night. You can put the strap around your finger and angle it downwards to see. Bonus that it comes with a helmet mount included. Wish it had a flashing strobe option instead of a pulse. Side orange lights are a nice feature. I use my light both day and night to make my presence known to other users of the road and bike paths. Super lights, best mounting system around, so easy to put on and take off, easy to use, great light pattern, bright and light. I use on helmet, on bar , mounts on fork etc. I have 4 of these and they are super nice, esp for the price. Nice to have the side lights as well. Very well designed product. I used Urban 800 everyday when I came back from work. It was very difficult to ride with other product. So I decided to buy this. Urban 800 is so easy to attach and detach. Therefore, it is free to be stolen. Moreover, I also used this for camping and my house under dark condition. I strongly recommend this if you ride at evening and night. Have used this for night riding (MTB) in the Northeast U.S. Paired with a helmet light, it is bright and sensible, easy to charge. Haven't been out for much more than an hour or so on any given ride, but it shines bright enough throughout. As big as my thumb, but the brightest light I have yet. I had to give up on nightrider lights and glad to find Light and Motion. The lights are more compact, brighter, easier to aim and the mounting system actually works. The high setting is too bright, you'll want to point it at the ground or your bike unless blinding someone is your goal. Which is certainly doable. The 800 is almost too much for commuting, but perfect for fast dark rides on empty roads. The light is very bright I can see the road great in dark morning . Hard to charge. No idea how much battery is left. Light works great if you can get it to charge. Not just myself but a few of us nightriders have had the same issue. Plug it in to the usb port and it says it's charging but when we hit the trail it will go out within half an hour on the middle setting? My computer said it didn't recognize the device and wouldn't charge it. I had to use my apple converter to get it to charge. Also the little rubber part that protects the usb plug in disappeared after the first ride on both units I bought. I wish it had a gauge to tell you how much charge was in it.